to evaluate the main clinical symptoms associated with the toxic effects of antineoplastic therapy in women with breast cancer at a cancer treatment center in the city of Caruaru/PE. This is an analytical and transversal study with a quantitative approach, carried out between September and December 2017, whose data source was the medical records of the patients included in the study. the majority of the sample consisted of women aged between 41 and 50 years (28.6%). This study made it possible to identify the most frequent histological type of breast cancer, with invasive ductal carcinoma observed in 88.6% and the most used protocol was Doxorubicin, Cyclophosphamide and Paclitaxel. Alopecia (91.4%) was the main adverse event observed in patients. it was possible to verify that the observation of these effects, allows a better control during the therapy, enabling improvement of the time and quality of life. evaluar los principales síntomas clínicos asociados con los efectos tóxicos de la terapia antineoplásica en mujeres con cáncer de mama en un centro de tratamiento del cáncer en la ciudad de Caruaru/PE. este es un estudio analítico y transversal con un enfoque cuantitativo, realizado entre septiembre y diciembre de 2017, cuya fuente de datos fueron las historias clínicas de los pacientes incluidos en el estudio. la mayor parte de la muestra estuvo formada por mujeres de 41 a 50 años (28,6%). Este estudio permitió identificar el tipo histológico más frecuente de cáncer de mama, con un carcinoma ductal invasivo observado en el 88,6% y el protocolo más utilizado fue la doxorubicina, la ciclofosfamida y el paclitaxel. La alopecia (91,4%) fue el principal evento adverso observado en los pacientes. fue posible verificar que la observación de estos efectos permite un mejor control durante la terapia, lo que permite mejorar el tiempo y la calidad de la vida. Breast cancer is the most common among women in the world and in Brazil, accounting for about 25% of new cases per year, the estimated number of new cases for the year 2016 is 57,960. Breast cancer may also be present in men; however, it is very rare, accounting for only 1% of the total cases of the disease. Relatively rare before age 35, breast cancer increases its incidence proportionally with advancing age, especially after age 501. Mammary neoplasia is a pathology feared today, especially by women. It is commonly associated with physical mutilation, changes in style and quality of life, and despite the technological advancement in health in relation to treatment and the increase in mass-mediated information, neoplasia rates are high worldwide, in the that it is Brazil generally the disease is diagnosed in advanced stages, making treatment difficult2. When breast cancer is diagnosed, the patient will undergo a combination of treatments, including surgery, radiation therapy, chemotherapy and hormone therapy, as well as possible unconventional treatments for her physical and mental well-being3. The main goal of antineoplastic chemotherapy is to destroy the cancer cells while preserving the normal ones. However, many chemotherapeutic agents act in a non-specific way, damaging both malignant and normal cells of rapid division, such as gastrointestinal, capillary and immune systems, leading to side effects of chemotherapy such as: nausea, hair loss and greater susceptibility infections. In addition, the fact that the biochemical and morphological differences of normal and malignant cells are minimal there is a difficulty in the immune response on top of these cells and this facilitates their growth so that they develop resistance to antineoplastics rapidly4. The antineoplastic agents most employed in the treatment of cancer include polyfunctional alkylants, antimetabolites, antitumor antibiotics, mitotic inhibitors and the like. New drugs are being permanently isolated and applied experimentally in animal models before they are used in humans5. A better knowledge of the adverse effects in response to different protocols commonly used in antineoplastic therapy of breast cancer will allow a better definition of the main effects presented, thus allowing the development of strategies and behaviors that minimize these effects, improving the patient quality of life. The objective of this study was to evaluate the main clinical symptoms associated with the toxic effects of antineoplastic therapy in women with breast cancer at a cancer treatment center in the city of Caruaru/PE. This is an analytical and cross-sectional quantitative study, carried out between September and December 2017 in an oncology center, located in the city of Caruaru/PE. Data collection was performed through a questionnaire with the following variables: age, tumor histological type, chemotherapy protocol and cycle. The undesirable effects presented by the patients during the chemotherapy treatment were also identified through the analysis of the medical records and the patient reports. Included in the study were all women diagnosed with breast cancer treated during the study period who were older than 20 years and who were taking antineoplastic therapy. On the other hand, women who underwent radiation therapy and patients who abandoned chemotherapeutic treatment were excluded. The information obtained through the data collection was organized and analyzed through descriptive statistical techniques through absolute distributions, percentage of measures and techniques of inferential statistics. The software used was EpiData and Microsolft® Office Excel 2013. All procedures performed in studies involving human participants were performed under an approved protocol and in accordance with the ethical standards of the Institutional Research Committee of Caruaruense Association of Higher Education and Technical (Approval No. 2.158.459) and with the 1964 Helsinki Declaration and its later amendments or comparable ethical standards. The study consisted of 35 female patients on antineoplastic chemotherapy. According to Table 1, the age group with the highest number of patients was 41-50 years (28.6%), followed by patients aged between 51 and 60 years (22.9%). In the histological classification of cancer, we highlight the invasive ductal carcinoma, 31 women (88.6%), followed by lobular carcinoma, three women (8.6%) and lastly other types of cancer, one woman (2.9%). It was also verified that about 23% of the patients had hypertension and 8.6% had diabetes. 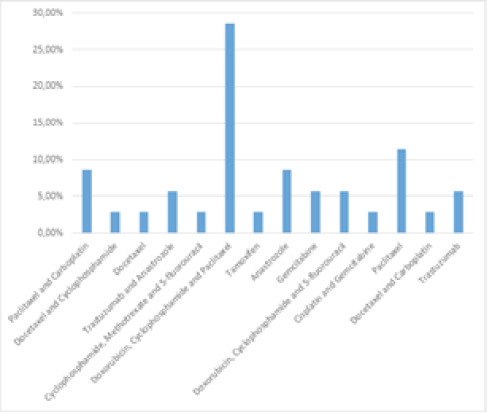 As shown in Figure 1, the protocols most used by the study patients were as follows: Doxorubicin, Cyclophosphamide and Paclitaxel (28.57%), Paclitaxel (11.42%), Anastrozole and Paclitaxel and Carboplatin (8.57%). Figure 1: Relative frequency of protocols used by patients undergoing chemotherapy. Caruaru, Pernambuco, Brazil, 2017 (n= 35). The main adverse events observed in the patients during chemotherapy were alopecia (91.4%), nausea (85.7%) and vomiting (68.6%), as observed in Table 2. Table 3 shows the association of the protocols most used by the patients and the adverse events presented by them during the study period. It was observed that 29.6% of the patients who used the protocol Doxorubicin, Cyclophosphamide and Paclitaxel (AC-T) presented alopecia, in contrast to the patients using the protocols with Paclitaxel (Tx) and Paclitaxel + Carboplatin (Tx + CBP), only 17.4% and 14.3%, respectively, presented with alopecia. Table 3: Absolute and relative frequency of association of protocols and adverse events presented by patients diagnosed with breast cancer in an antineoplastic treatment clinic. Caruaru, Pernambuco, Brazil, 2017. Legend: AC-T: Doxorubicin, Cyclophosphamide and Paclitaxel; Tx: Paclitaxel; Tx+CBP: Paclitaxel and Carboplatin. Source: Research data. During the research, alopecia was the most frequent absolute and relative adverse event in all cycles studied, as shown in Table 4. In this study, it was possible to observe that the age group from 41 to 50 years (28.6%) was the most incident, which confirms with another study carried out in the city of Ribeirão Preto, located in the state of São Paulo, where there was a predominance of age between 41-50 years (40.9%)6. The most common histological type was Invasive Ductal Carcinoma (88.6%), presenting similarity to a retrospective epidemiological and descriptive study conducted at the Crato Specialty Center, Ceará (77%)7. Another study conducted between 2000 and 2009 observed that the most frequent tumor histology among the included patients was the Invasive Ductal Carcinoma with 90.7%8. A survey of 285 individuals diagnosed with some form of cancer concluded that 45% of the patients were hypertensive and 14.03% declared themselves diabetic. This result is in agreement with what was found in this study, since the prevalence of systemic arterial hypertension (23%) was higher than that of diabetes mellitus (8.6%). It is important to highlight that these chronic diseases have negatively interfered in the quality of life of individuals affected by these diseases, as well as their great economic impact to the Unified Health System (SUS), considering the high sums allocated for prevention, health promotion, to the treatment and recovery of these pathologies and their complications9. The AC-T protocol (Doxorubicin, Cyclophosphamide and Paclitaxel) was the most used among the patients during the study period. The same result was obtained in the research carried out in a general, university and public hospital, in the hematology-oncology outpatient clinic, located in the State of Paraná, whose hospital attendance is solely by SUS10. Chemotherapy brings with it several commonly expected adverse effects during treatment, such as: nausea, vomiting, diarrhea or constipation, alopecia, among others. It is necessary to evaluate the cost-benefit of each treatment, since the answers are individualized and requires a timely and effective intervention to minimize them11. Among these adverse events, alopecia (91.4%), nausea (85.7%), vomiting (68.6%) and physical fatigue (65.7%) were the ones with the highest rates in this study. A total of 91.4% of the women had alopecia, which is defined as the loss of hair and any other body hair such as the eyebrows, the axillary, pubic hair and/or the legs and arms. This side effect occurs after one to two weeks of the onset of chemotherapy and is due to the lack of hair production or thinning caused by the abrupt interruption of the mitotic activity of the capillary matrix, which leads to the weakening of the capillary shaft causing the hair to fall during the act of combing, hair washing or even handling. Hair loss becomes more pronounced about one to two months after starting chemotherapy and, with repeated cycles of it, can lead to total alopecia12. Among the gastrointestinal adverse events we may mention nausea, vomiting, mucositis, diarrhea, anorexia, stomatitis, discomfort or abdominal pain, but those referred by cancer patients as the most stressful and uncomfortable are nausea and vomiting. They occur together or isolated, however they must be evaluated separately, because they are distinct events, with also different causes. In a study of 79 women aged 29 to 69 years, 93% had nausea and 87% had vomiting13. The literature draws attention to the fatigue symptom, since it can directly interfere with women’s emotional well-being and quality of life. The caveat is for health care professionals who must be prepared and alert to guide patients by helping them recognize fatigue and clarifying appropriate ways to relieve this symptom11. The greatest benefits of chemotherapy came when the drugs were combined into regimens, the most common of which include a drug of each class example: adriamycin, cyclophosphamide (AC); 5-fluorouracil, adriamycin, cyclophosphamide (FAC); 5-fluorouracil, epirubicin, cyclophosphamide (FEC); adriamycin, cyclophosphamide, paclitaxel (ACT), among others. Unfortunately, the adverse effects of these therapies have become another major problem within oncology and public health. Cardiovascular comorbidities, the risk of onset of another tumor induced by the treatment, pulmonary alterations, fatigue and excessive and persistent pains, asthenia, depression, anxiety, are symptoms commonly reported by people undergoing chemotherapy. Individual tolerance to these effects has been the limiting factor in the use of chemotherapy doses14. Sanches et al15 demonstrated a significant incidence of alopecia in combination regimens, such as: 50-100% with carboplatin, paclitaxel and 90% with cisplatin, etoposide 15. In view of this research, it can be seen that the incidence of this cutaneous reaction is higher in the protocol Carboplatin and Paclitaxel, confirming with the data of our study. It is important to emphasize that breast cancer is a public health problem in Brazil, because it is a disease of high frequency among women and has numerous adverse effects during drug therapy. In view of this study, it was possible to verify that alopecia presents as the most frequent adverse effect during oncologic chemotherapy, where the protocol combined with Carboplatin and Paclitaxel expressed this effect in greater proportion. Symptoms such as nausea, vomiting and physical tiredness are common among the patients studied, considering the different protocols and time of therapy. The observation of these effects during the treatment, allows a better control during the chemotherapy, enabling improvement of the time and quality of life. New studies, including new protocols should be performed, seeking to observe the various toxic effects of therapy. In this way, it will be possible to better care for women’s health and a qualified and humanized care.